A Fire Pit Warms Up Every Backyard! A fire pit is a great addition to nearly every backyard. Whether your use it as an additional cooking option or just to knock off the night chill, it's hard to match the warmth and ambiance of an outdoor fire. 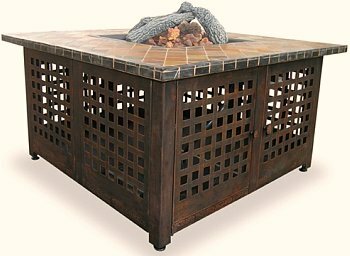 There may be no better way to provide that than an outdoor fire pit, which is essentially a container for fire that stands up off the ground on short legs. They can sit on your deck or patio, or they can be placed out in your yard. You'll find that friends and family will naturally gravitate to a fire to talk, relax, and just enjoy each other's company. It's no wonder, since the benefits are many. Kids (of all ages) love to hang out around a fire. There are many styles, both in terms of aesthetics and functionally. Some models have an available cooking grid that allows you to use it as a cooking fire. Of course all of them can be used to toast marshmallows or roast wieners. Some styles have a shelf for wood storage. Most styles have safety screens and covers. There are really only two options for fuel in a fire pit. Either wood or gas, although the gas can be propane or natural gas. So which one is best for you? That depends completely on your preferences. Gas is cleaner and easier. You just light it and enjoy! No ashes, no cleanup required, no fuel to gather (except for making sure your propane tank isn't empty). Wood burning models require more maintenance, more cleaning, and, well, wood! So you'll have to make sure you keep enough wood on hand - do you have a source for firewood? It will need to be cut and split to the proper size for your pit. You'll need a place to store it and keep it dry. So there is obviously more time and effort involved with a wood burning model - but oh, what a payoff for that effort! Gas fire is warm, but it lacks the smell, the sound, and the "charisma" of a wood fire. Still, think honestly about how and where you will use your outdoor fire pit. If the effort required for a wood fire will prevent you from using it very often, then gas may be better for you. If you tend to go outside for short periods of time, then wood probably doesn't make sense. After all, it may take ten minutes to get a wood fire going, and then it will burn for quite a while. 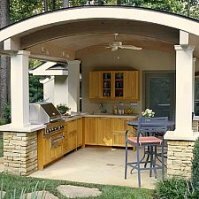 If your outdoor gatherings last longer, then consider a wood burning model. Either way, fire will add to your outdoor living experience. Gas styles cost substantially more than wood burning models, sometimes as much as ten times more. The gas isn't free, but the wood has to come from somewhere, too. If you have to buy precut bundles of wood at a store, you will spend far more on wood than you would have on gas. If a friend or neighbor can provide free or cheap wood, or if you can get wood from your own property, you'll save fuel money. Just weigh out the options and decide which fuel type will work best for you. When talking about fire pits, the notion of portability needs to be clarified. There are truly portable fire pits that have wheels, similar to a typical charcoal grill. So if you need real ease of movement, that may be your best bet. 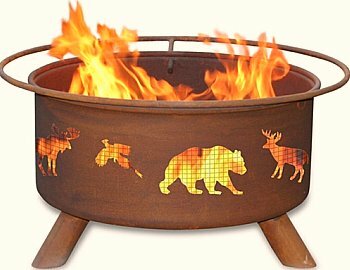 Most of the "portable" style of fire pits don't have wheels. Instead, they are fire bowl style models that can be picked up and moved around, although you'll probably need help to pick them up and move them. But since they are not attached to the floor or the ground, they can be re-positioned fairly easily. Most often, there is no need to move these styles on a regular basis, so portability isn't a huge consideration. However, they can be moved around fairly easily, even taken to an entirely different location if you want. Table style models are available in hundreds of styles, shapes and colors. They are made of stainless steel, wrought iron, bronze, copper, and more. 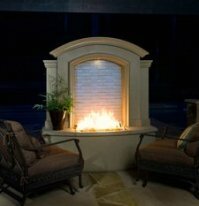 The table surface around the fire can be covered in tile, granite, slate, metal, or other materials. Many models have decorative cutouts around the sides. Those aren't just for looks - they let the warmth radiate out in addition to up. And they look pretty cool at night with the fire showing through. Most tables are very durable and require only limited care and cleaning. They can be square, round, oval, or rectangular. They can be coffee table height, dining table height, counter-top height, or bar height. 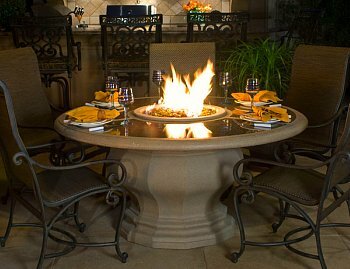 The size, shape, and height of your table style fire pit will need to be determined by how you plan to use it. 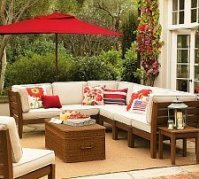 Since the fire will usually become the focal point of your outdoor gathering, give careful consideration to it's design. If your deck or patio space is small, your fire pit will need to be sized accordingly. If your outdoor activities are typically limited to 3 or 4 people, there's no need for a large fire pit when a smaller one is just fine to chat around. Fixed styles are discussed in a separate article. Be careful when building a fire anywhere. Never place it close to your house walls, a wooden deck rail, or any other combustible material. Be aware of anything hanging over the fire, including tree limbs. In the yard, be careful of dry grass or brush that could ignite. Many models come with warnings or special instructions for use on wooden decks. The ideal placement option is on a concrete pad or on a patio. They are usually fine directly on the ground, just keep flammable material a safe distance away.